As much as I love spending the entire day in the kitchen on Sunday preparing our Sunday dinner, I just don't have the time during the week. Most weeknights are spent driving to and from practices, lessons and playdates for my three children. So, I need a dinner that can come together quickly. It is easy to pick up the phone and order pizza delivery, but when you can put together a meal that is healthy and satisfying with just a few ingredients-- that's the way I want to go. 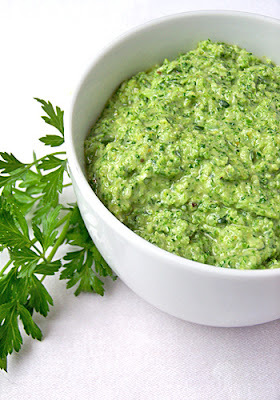 This pesto is the answer. It is great on pasta, but it is also delicious with fish and chicken. I have even made it in the summertime with cold pasta and poached shrimp to take on picnics. The extra credit-- it is a great way for your kids to eat their veggies! 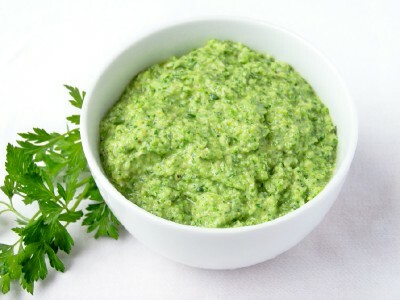 In the bowl of a food processor combine the broccoli, parsley, garlic, and Parmesan and begin processing. While the processor is running, add the olive oil in a thin stream and blend until smooth. Add salt and pepper to taste. Enjoy! This looks delicious and I LOVE that it is kids friendly! I make pretty much the same thing with spinach instead of broccoli. I usually use half a bag of baby spinach. Since it only needs to warm through with the pasta, there's no need to steam it first. Thanks for sharing your variation. Sounds good! Love the recipe! How long do you think i can keep it in the fridge? It will keep for at least three days, but it never last that long in my house. 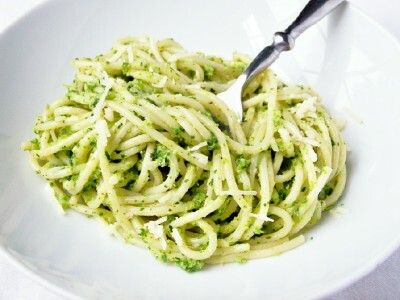 We toss it with pasta for an easy summer meal.